This text describes the second assignment in the course 2DV514. This assignment could seem pretty big but remember that it will be done in groups. The company ACME Corporation are having some problem with their website. After releasing new products last months there website have been receiving a lot more traffic. This has led to the site being slow and sometime unresponsive. The site is built around the CMS system Wordpress and today it's hosted on an single server running all of the required tools like database, static files, WordPress etc. Another problem the company has with the website is how it is being configured. Two years ago they had a hard drive crash and had to rebuild there infrastructure. They had no automated configuration so they had to rebuild it manually. The company have given your group the assignment to fix these two problems. To be able to handle the load increase on the web site you must introduce a load balancer and to be able to do that you must separate the different services. You should redesign the infrastructure to support the DevOps mindset with configuration management when moving the old single instance solution to a more scalable one hosted on a OpenStack cloud using a configuration management tool. Before starting with the infrastructure you need to know the different components of Wordpress. 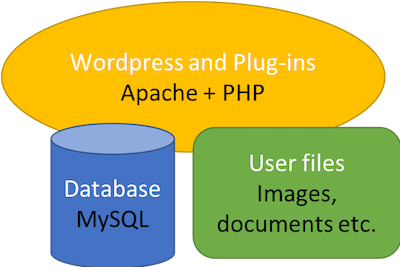 The Wordpress code base (version 4.6) and the code for plug-ins - This runs on an web server with support for PHP and only changes when you update/upgrade Wordpress or one of the plugins. Database server, MySQL or MariaDB - This holds persistent data like user accounts, site pages, news, plugin data and so on. User files - Administrators of the site can upload images and other document to the platform, these are usually stored in a folder on the web server. But when you want to scale the web servers you need to move the storage of these files to a central location, like a file server. The group needs to analyze and discuss the existing infrastructure and develop a new solution that supports ACME's new needs. During the first supervision meeting you will present your solution. When you have a clearer overview of the different components of the new design you will have to figure out how the infrastructure should look like. What servers are needed? How to handle load balancing? Proxies? Monitoring? DNS servers? Backup? The group should discuss this matters and provide a image of the infrastructure when having the second supervisor meeting (see below). Of course the infrastructure should be handle with the mindset of DevOps and "Infrastructure as Code". You should use a configuration management tool and all of the infrastructure specific code should be version managed in a git repository provided by the course management. This repository will be part of the examination. If you need more data or information be sure to ask for it on the iterative meetings where the teachers also will act as customers. How does your system handle changeability? If we want do upgrade the version of some of the application platforms how will it work? How will security updates be handle? Try to describe and perform a scenario and how your solution is handling this. Along with the report record a video that show how a upgrade to ubuntu version 18.04 and Wordpress version 4.9.8 is done. How does your team work with version control tools Describe which tactics where used when working with version control. How could you diverse the work and avoid merge conflicts? Recreation Your infrastructure should be easy to destroy and recreate with as so little work as possible. Describe how your system work and how you recreate the infrastructure. Also record a video showing how the infrastructure creates and is removed. There should also be very clear instructions for the examiners how to create the infrastructure on a empty OpenStack project. This should be able to do with one command for creating and one for destroying. Every single student should also send a individual work diary describing how many hours and what that student have worked in the project. The diary should give the examiners a quick and simple guidance to what you have done in the project. It is very important that this work is done every day and not in the end of the project! What has gone good and what has gone bad in the project? This should be sent to the course e-mail before deadline. During the project the group will have meetings with the course management. There are several pass booked into the course schedule. This meetings are mandatory. Your group decides which of you that will participate in the meetings (all or just one person) but some should always be there. During this meetings you should describe what you have done, how you have separated the work and how you will work until the next meeting. Try to keep these meetings effective and be prepared. For example; you want to talk about your infrastructure, then make sure you have an image over it so there will be no problem to understand each other. Meeting 1 - see Part 1. You should also decide on a project planing system (use the Github built-in? ), how the group should work with VCS, how to report your time in the project and so on. The following meetings will be discussed during the meetings. As said before this could be a pretty big project with many technologies. Therefore you must be effective when split the work between team members. Maybe take different roles where some is responsible for the software, some starts learning and test the configuration management tool and so on.